The Tineco name probably isn’t one you’re familiar with, but it’s one you should absolutely be considering when thinking of picking up a new stick-style vacuum. It’s also a name that is part of the Ecovacs brand, one that I’ve spoken about here before when reviewing one of the company’s robotic vacuums. The company sent out its latest Tineco A10 Hero cordless vacuum and it might just be the biggest bargain you didn’t know you needed. To look at, the Tineco immediately makes you think of the Dyson vacuums that have been well publicized in recent years. Dyson is perhaps the biggest name in this space, but that doesn’t mean that it should necessarily be the name that you land on when making a buying decision. 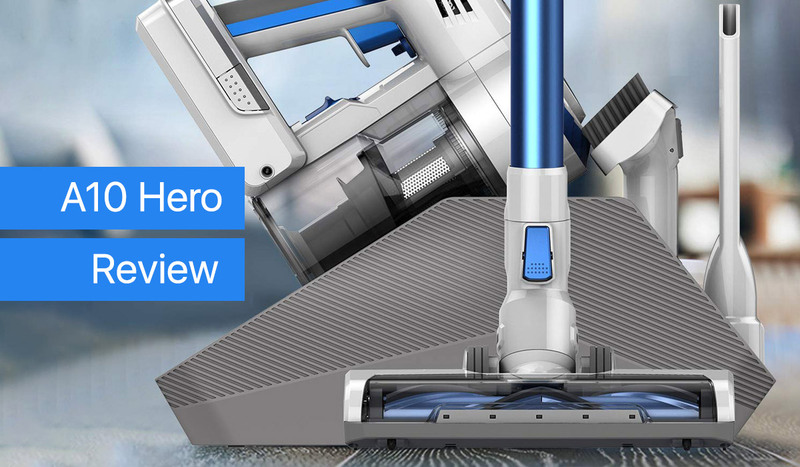 The Tineco A10 Hero doesn’t only look like a Dyson – the V8, for example – but it performs like one, too. There are two versions of the Tineco A10 to consider – the A10 Hero is the base model, and the one I’ve been testing for the last few weeks, while the A10 Master is the same vacuum, but with an extra attachment and an additional battery thrown in. Beyond that, they’re the same, so if you want the extra bits and bobs, you can make that decision yourself. So what do you get with the A10 Hero? Everything you’d need, really. There’s the vacuum itself, which is nicely weighted at 2.87lbs without being heavy. It feels solid in the hand but at no point does it feel cumbersome to wield, which is important for a vacuum that is designed to be handheld. The 350W digital motor is plenty powerful, but it won’t terrify the neighbors when turned on, either. The detachable battery is good for around 30 minutes of use in low-power mode and just under ten minutes in full-power model, which is comparable to the competition. Inside the box is a collection of accessories that will see most people happy. 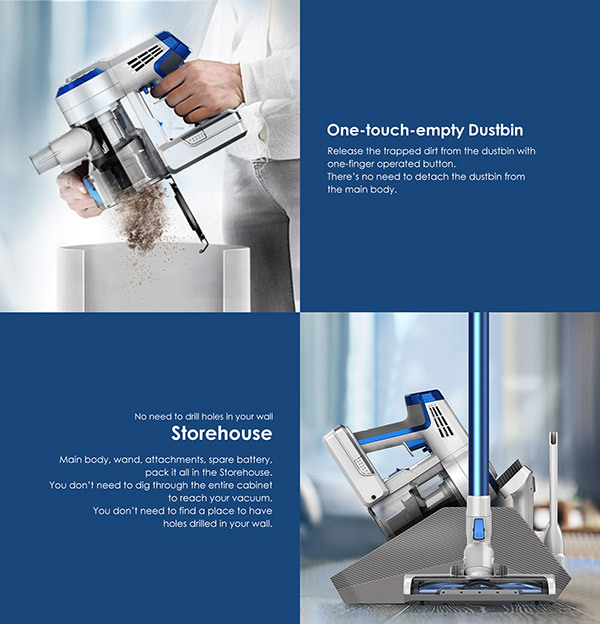 The included dock doesn’t charge the vacuum, but it acts as a nice home for the unit and its attachments, meaning you won’t have things strewn everywhere. 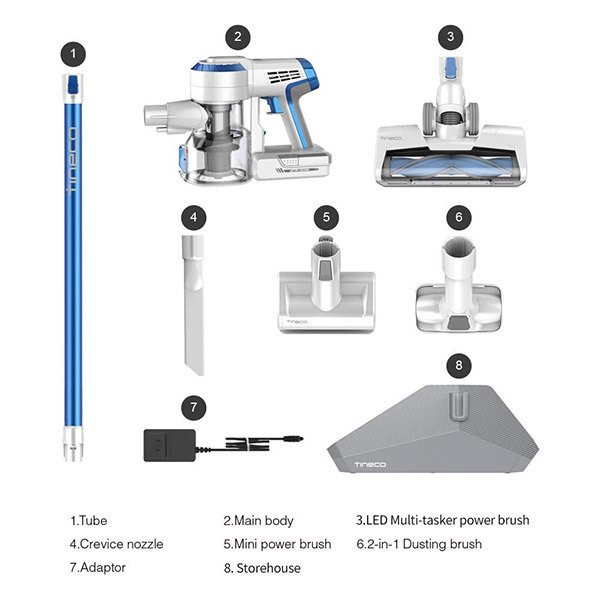 Those attachments include a full-size multi-tasker LED power brush, mini power brush, 2-in-1 dusting brush, and crevice tool. That LED power brush is pretty amazing, and if you’ve ever cleaned under a sofa or table with no idea what you’re about to pick up, this is the tool for you. Emptying the A10 Hero is a case of undoing one lock and watching the debris fall out, so be sure to have a bin underneath. It’s super-easy to clean, and there’s a removable HEPA filter around the back of the unit, too. Having used a Dyson, I’d say the A10 Hero is on par here, which is impressive given the fact Dyson’s hardware is always great at coming apart, ready to be cleaned. In use, the A10 Hero gets the job done, whether in low- or full-power mode. I cleaned hard-wood flooring, relatively thick rugs, and carpeted stairs and this thing didn’t miss a beat. In fact, it never needed to be placed into full power mode, which was great for battery life. No matter which mode is used, the switch that means the vacuum runs without the need for the trigger to be pulled is brilliant, too. If you’ve ever suffered from cramp from clutching at a Dyson’s trigger during a cleaning session, you’ll know why this is so great. You’ll have noticed that I’m mentioning the Dyson vacuums a lot here, and with good reason. They’re the brand to beat, and will enviably be the vacuums that the Tineco A10 Hero is held up against. In all regards, the Tineco offering stands up to the job very well indeed, and we haven’t even gotten to its party piece yet – price. The Tineco A10 Hero that I’ve been testing costs just shy of $190 at its normal every-day price, which is about half what you can pay for some of Dyson’s competing products. That’s a saving that cannot be ignored, and it’s impossible to say that this isn’t just as good in the vast majority of ways that matter. I’m a huge fan of the A10 Hero after using it for a few weeks, and I can’t imagine spending Dyson money to get something else. It even looks nice in its blue and white getup. The same can’t be said for some of the garish colors Dyson has chosen over the years! Right now, you can save even more money, too. The folks at Tineco are offering a couple of special deals for RP readers, both making for some great prices on the A10 Hero and A10 Master. No matter which you choose you’ll get a great vacuum that punches above its weight. At these prices, you could forgive a lack of attachments, or a poor battery, or perhaps no storage solution. But to have everything in the box, and have it work as well as it does, it’s difficult to justify spending Dyson money when options like this are on the table.